A cat's nose leather comes in a variety of colors. It can be of a solid color much like the color of its coat - grey, pink, black - or can sometimes be a combination as can be seen with bi color cats. We were having so much fun rubbing noses with Ashkē today and thought about sharing it with you guys. That's one healthy cat's nose! According to TheCatSite.com, one way of evaluating your cat’s overall health is to check its nose. 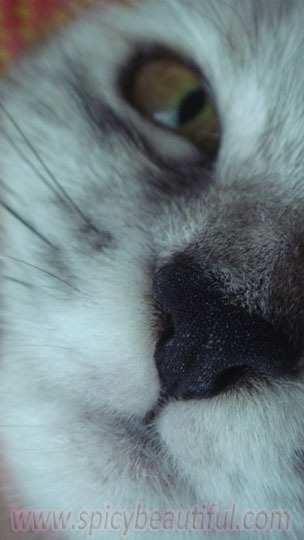 A healthy cat’s nose is “velvety” and “pleasant” in texture. Ideally, it should be moist but it can also be dry depending on the environment’s temperature. If it’s too wet with heavy nasal discharge, a visit to your veterinarian may be necessary to check if a respiratory infection is present. Have you checked your cat's nose lately?